The Parc de Joan Miró now uses the area of a park to the former slaughterhouse, the Parc de l'Escorxador. It is worth it to see the the south-western part of the Parc de Joan Miró. This is the lower part of the park, where is the clear-ambiguous sculpture by Joan Miró. The sculpture Dona i Ocell (Woman and Bird) dominates this part of the park. The sculpture sits on a small island in a water basin, the figure is - typical of Joan Miró - decorated with ceramic breakthrough. Miró has done the Sculpture in 1982, a year before his death. A little imagination is needed already, to recognize in this statue a woman and a bird, but we also recognize many other things.... Impressive is Miró's 22 meters high sculpture in any case. Throughout the park are scattered 30 smaller sculptures by Miró. The place would have been without the sculptures of Miró no major detour worth, but he invites you to linger. At the bottom, north-eastern area there are at the Parc de Joan Miró beautiful places under shady palms, pines and Eucalyptus plants, which are almost predestined for idleness. It is a little quiet. Above all, older people use the sandy areas between the palm trees for a round of bowls or chess. The peace and serenity to the place and its visitors accounted for, this 1979 renewed investment is so endearing. 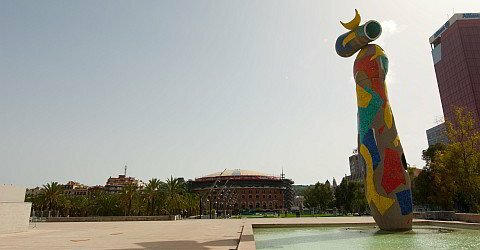 Between the park de Joan Miró and the Plaça Espanya, is the former bullfighting arena, in which bullfights took place in Sunday evenings. This is despite to the declaration of the city Parliament, to declare Barcelona to a bull fight free zone. A little to match the previous name "slaughterhouse". A constantly light wind makes a certain coolness even on hot days. The park is fairly quiet, apart from the cries of the parrots. Ideal to take a break and drink a coffee.